Varma invests in continuously improving its customer service and the service skills of its personnel. We develop our clients' workability management in close co-operation with them to improve the occupational well-being of their employees. We aim for the lowest pension costs in the sector for our customers. Despite the tightening competition in the earnings-related pension sector in 2012, Varma maintained its strong market position. The private sector payroll in Finland rose about 4 per cent to EUR 59 billion in 2012. However, exceptionally extensive co-determination negotiations and layoffs continued, focussing especially on globally operating industrial companies. Varma’s customer base is traditionally rooted in Finnish basic industry, and the layoffs reverberated throughout our customer base. Despite the structural change in industry, Varma’s TyEL payroll increased to EUR 17.7 (17.3) billion. Competition in the pension sector has been getting stiffer during the past ten years. Increasing competition benefits both the earnings-related pensions system and customers. On the whole, Varma succeeded well in the contract transfer rounds: new customers were received especially in conjunction with corporate restructurings. Varma's total premium income rose and stood at EUR 4,230 (3,977) million, of which TyEL policies accounted for EUR 4,041 (3,802) million and YEL policies for EUR 190 (175) million. At year-end, Varma provided insurance for 539,700 (540,300) people. 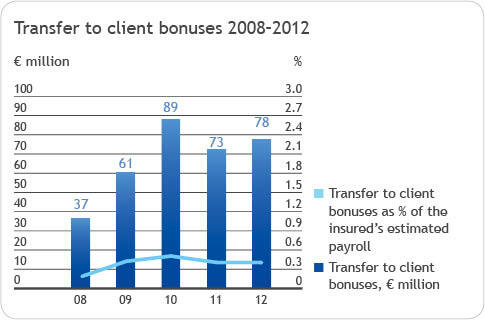 Varma reserved EUR 78 (73) million, or 0.4 (0.4) per cent of the employers’ TyEL contribution, from 2012 for client bonuses. The euro amount of the sum transferred increased over the previous years, due to the strengthened solvency capital. For several years, Varma has given its clients the best bonuses in the sector, and in 2012 the company maintained the bonuses at a competitive level. Client bonuses lower the employers’ final contributions. The amount of the bonuses is influenced by the pension company’s solvency capital and by the loading profit, an indicator of the cost-efficiency of operations. We provide our client companies with effective and proficient earnings-related pension insurance and workability management services that assist our clients in controlling pension costs. We aim for the lowest pension costs in the sector for our customers. Varma develops its customer service by listening to the customers and charting their needs. In 2012, Varma concentrated on deepening the competencies of its customer service personnel and the processing of its customer data, which helps us to identify, together with our clients, trends that threaten the work capacity of their personnel. Varma’s online services have been growing considerably in popularity in recent years. In fact, online services are now preferred over using the phone as a means of contacting the company. Varma has customer-service professionals who specialise in insurance and pension matters that particularly concern entrepreneurs and small businesses. For self-employed clients and small client companies, Varma offers a comprehensive service network with our co-operation partners, If, Tryg and Nordea Bank. In late 2012, If P&C Insurance Company Ltd bought the Finnish business of Tryg Forsikring A/S, which boosts Varma’s efficient co-operation with Nordea and If. Major employers continue to receive services from a dedicated service team, which channels Varma’s entire expertise for the customer’s benefit. Outside the Helsinki region, our clients have the services of regional account managers at their disposal. Read more about our services for entrepreneurs and companies.